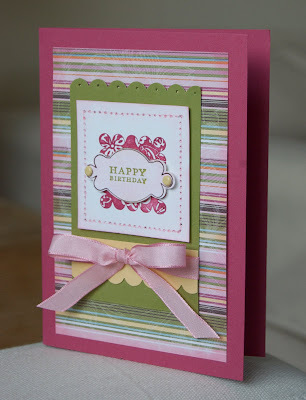 Have you had a chance to look at the Saturday challenge over at Stamping 411? I love working with stripes. It's so easy (but also fun!) to pick out colours and use them in the design. My trusty paper piercer came out too for a bit of faux stitching. If anyone were to ask me which tools I couldn't do without, my paper piercer would be high on the list. It has many uses - not least of which is a quick hole maker for brads! I had an amusing moment today when I bought the week's eggs from my neighbour. I had just put my change away in my purse and carefully placed the egg boxes in my basket when my neighbour's little boy decided to share a confidence with me. "We keep chickens you know," he said. Well, thank goodness those weren't dinosaur eggs! Hi Vicki! 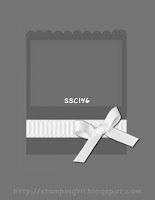 Thank you for your sweet comment about my card, thought I would check out your blog! I love your card btw. Have a goodie! Terrific card! Love those stripes and the sentiment with the punch! What a cute story about the eggs!!!!!!! Wowzer! This is so darn cute! I love the DSP you chose and the way you layered your images is just so pretty and neatly put together.. Delicate and Beautiful, thanks so much for playing along! I love this!!!! Truly I do. You've taken simple to new heights with this and made it "Fabulous"!!! I love stripes too. The layered image is beautiful!!! The brads are the perfect finishing touch!! I like striped paper and this is a particularly pretty one. Great sketch. For how-to's for the cloudy sky on my "turquoise garden" card check out this tutorial on my blog. The only difference is that I used a piece of cardstock punched with a scallop border punch in place of the ruler used in the tutorial and a sponge dauber and blue ink instead of chalk. I also worked from the top down instead of bottom up. Either method works. Hope that helps. Hmmm, where to start? I love it all! But, especially that dsp (I think that's my favorite of the whole pack! ), and the layered stamped images in the middle with the brads. Nice job! 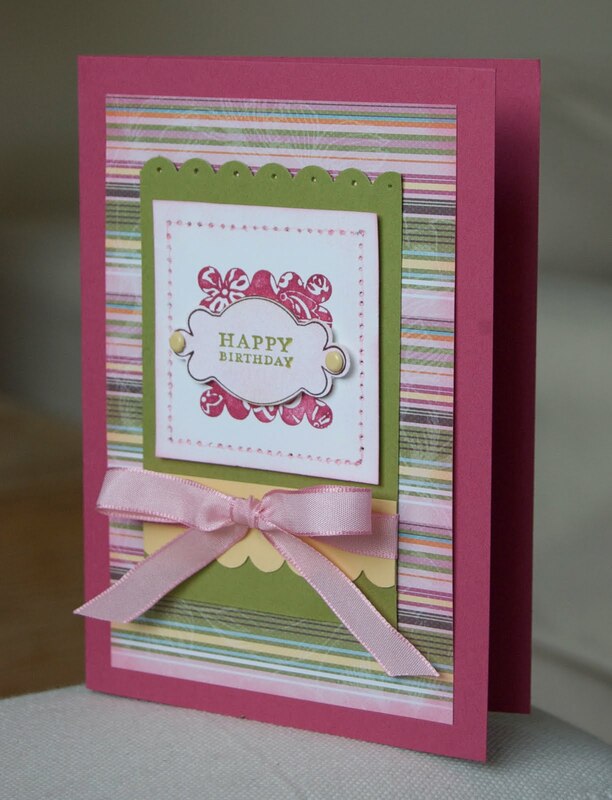 This is truly a lovely card - just beautiful with your simple touches and that dsp combo. Great job! Thanks for playing along this week! Love that Sweet Pea DSP...and layered focal image! Thanks for playing along with the sketch this week!